The History of WHOO is finally here in Singapore! One of the Korea’s largest luxury oriental skincare, The History of WHOO has opened their very first Singapore flagship counter at TANGS at Tang Plaza! After the revamped of Tang Plaza, my first time attending event at SEVIIN (TANGS). Thanks Vinna for the kind invitation to the event: The History of WHOO products introduction and Gua Sha Facial Massage Technique demonstration. I’ve learnt how GongJinbidan helps in our skin and some useful tips on Gua Sha by using Jinyulhyang Essential Massage Mask. Mentioning about GongJinbidan, its the ingredient that present in all The History if WHOO’s products. Consist of 6 oriental herbs to improve blood & “Qi” circulation and controls the balance of heat and water energy through *Su Seung Hwa Gang to achieve youthfulness while balancing the Yin and Yang energy (essentially slowing down the physical sign of skin’s aging). *Su Seung Hwa Gang describes water energy of the kidneys riding upward along the back of body, and fire energy flowing on the anterior part of the body downward toward the abdomen. The 6 herbs are: Deer Anler (鹿茸), Angelica Root (当归), Cornelian Cherries (山茱萸), Acanthopanax Root Bark (五加皮), Asparagus Root (天门冬), Wild Thyme (麝香). Introducing their STAR product, Bi Chup Ja Saeng Essence. A prestige 3 stage self-caring essence that strengthens skin cells to induce and enable skin’s self-defense to strength and repair on its own for superior recovery. 1. Self Regeneration – Strengthening of skin so that it can protect, defend & repair on its own. Use during morning and night, 2-3 pumps and spread evenly onto face, cup face with both palms to enhance absorption. 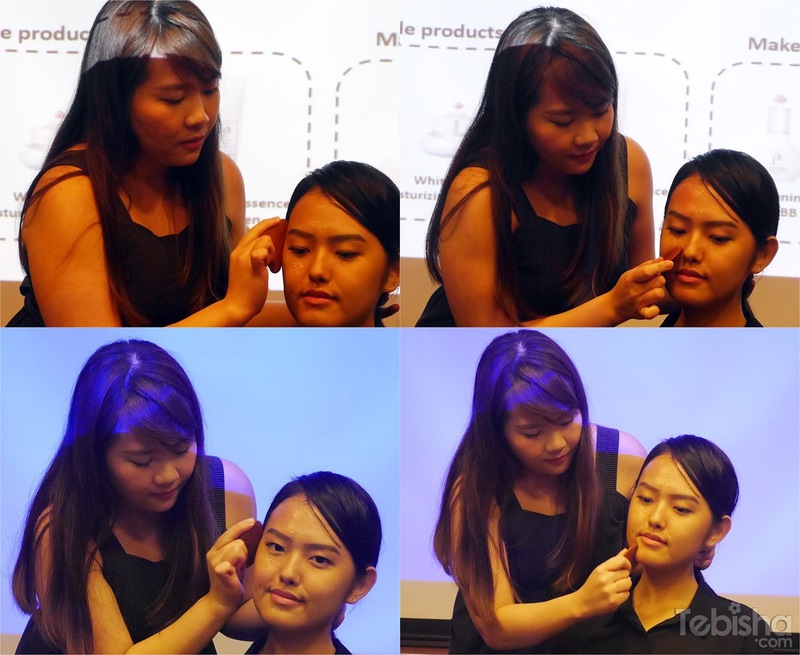 After the products introduction, we have Cheryl (Assistant Trainer) from The History of WHOO to demonstrate the “Gua Sha” Facial Massage Technique. Spread Jinyulhyang Essential Massage Mask onto your skin evenly. Then Massage your face using the Gua Sha tool massage from forehead to chin. Movement should be from inner of the face then out to the side. This traditional Oriental massage mask makes Jinyulhyang’s concentrate sappy essence to be absorbed around the spots of skin’s pathways in the face along which vital energy flows by the Oriental Massage (Gua Sha) tool made of rosewood. You can achieve the more elastic and radiant skin by using the massage mask at least twice a week. Jinyulhyang Essential Massage Mask comes with the Gua Sha tool. For ladies with radiance, brightening or whitening concerns. Royal court oriental formula to achieve bright, clear & moisturised skin. 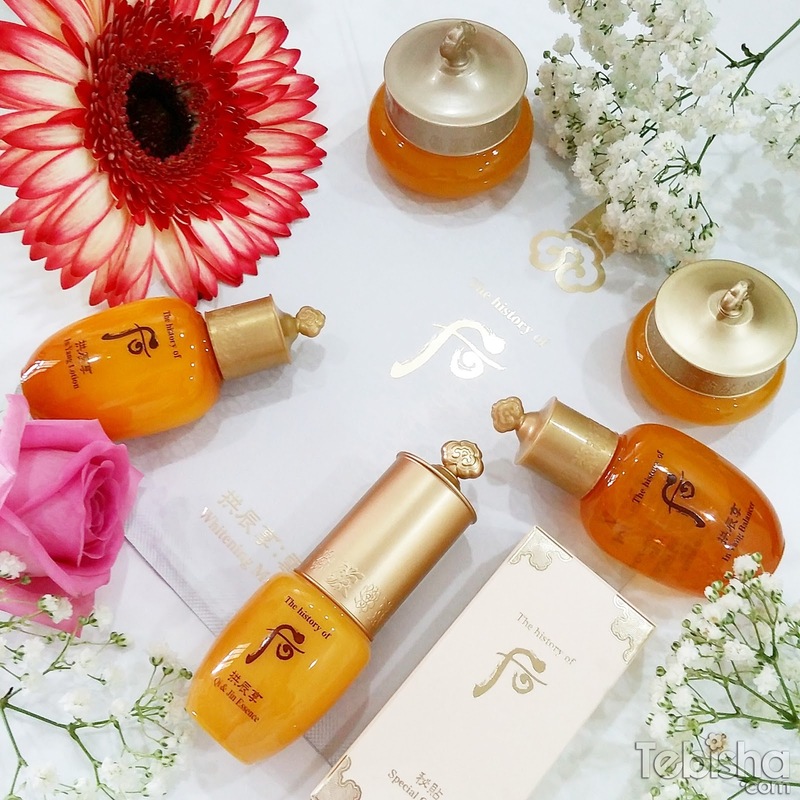 And their symbolic Hwan Yu range, Hwan Yu range is deemed as the most luxurious skincare from the brand. Formulated with more than 70 herbal ingredients, which includes 35 years old natural wild ginseng. This skincare range effectively delays skin’s aging process, while accelerating cell activites with its Gongjinbidan component to revitalise the skin, taking 10 years off the skin. Have been hearing so much rave about their Luxury Lipstick, so after the event, I quickly went down to the counter and get myself one! The shade I bought is Rose (the most popular shade, mentioned by the BA). Like The History of WHOO FB and follow them on instagram (@thehistoryofwhoo_sg) for updates! Visit their counter at TANGS (Tang Plaza) to try out their products, the friendly BA will be there to help and advise you. Big Thanks to The History of WHOO team for the informative event and the press kit!